One of the duties of a liveryman is to heed the summons to attend Common Hall twice a year, firstly on Midsummer’s day for the election of two sheriffs for the year and then on Michaelmas day to elect a new Lord Mayor of London, again to hold office for a year. 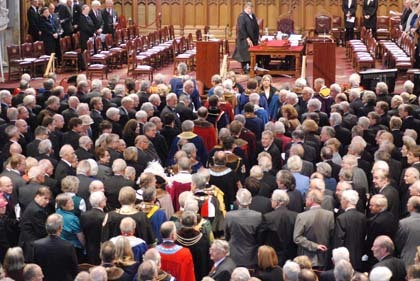 The elections are held in Guildhall and only liverymen are allowed to vote. This year Michaelmas fell on 29th. September, and at around 11.00 on that day, I joined the many hundreds of liverymen from all livery companies streaming into Guildhall, although I had been granted special permission to view and photograph the ceremony from the Minstrel gallery. Just prior to this, the many splendidly robed dignitaries including the current Lord Mayor, Nick Anstee, formed a procession and entered the adjacent Guild Church of St. Lawrence Jewry for a short service. 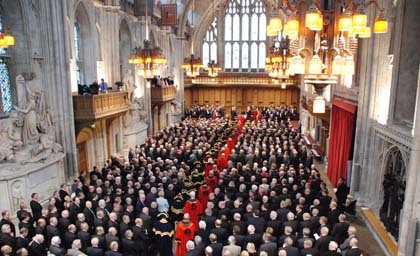 At 11.35, the Livery Committee, Masters, Prime Wardens and Upper Bailiff formed a procession and entered Guildhall, in strict order of precedence taking seats at the front of the hall. 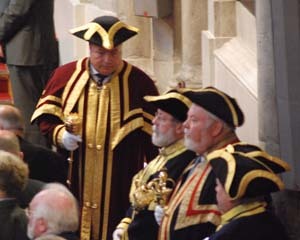 The Master Feltmaker can always be singled out as being the only Master allowed to wear a hat during the ceremony. 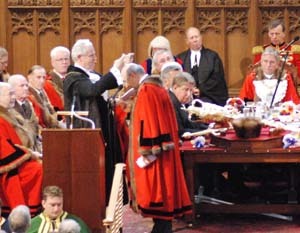 This procession was followed by the Lord Mayor, Aldermen, Sheriffs and other officers who took their seats on the dais. The ceremony was then started by the Common Cryer and Serjeant of Arms demanding silence and directing all men to be uncovered in the Hall, and that all those who were not Liverymen to depart the Hall on pain of imprisonment. The Assistant Town Clerk read the proceedings of the last Common Hall, after which the Recorder informed the Livery of the occasion of today’s meeting. The Lord Mayor, Aldermen, other dignitaries and officers then retired to the Print Room, in procession, preceded by the City Marshall and the Swordbearer. There they remained while the Livery cast their vote from the three candidates offered this year for election. Each candidate’s name was read out and their surname displayed on a large card. Liverymen indicated their preference by a show of hands, and a shout of ‘All’, for their favoured candidate. Their next favourite candidate received a shout of ‘Next Time’, and the third favourite, a shout of ‘Later’. 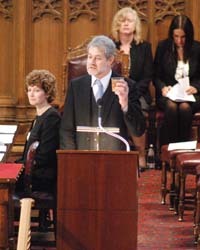 Liverymen were asked to return two candidates to be presented to the Lord Mayor and Aldermen, from whom they select one to be the new Lord Mayor. This year’s candidates were Michael Bear, David Wootton, and Roger Gifford – all Aldermen, as they must be to be eligible for this role. 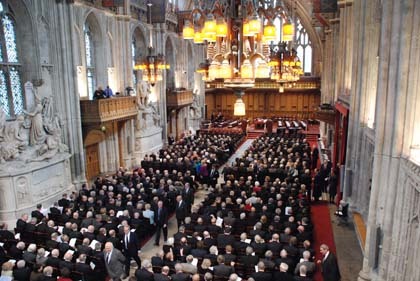 Guildhall was overflowing with Liverymen, seated to maximum capacity, and as all Liverymen have the right to cast their vote, latecomers were directed to an overflow area where they could, not only follow the proceedings via a video link, but also cast their vote via a video link monitored by the officials on the dais. 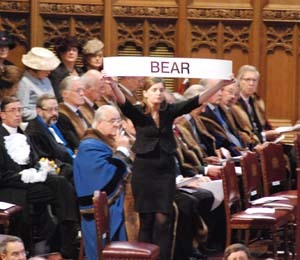 This year, the names of Michael Bear and David Wootton were passed to the Lord Mayor and Aldermen, and while they made their considerations, the Livery were addressed by the Assistant Town Clerk. This address, although it includes some formal information and content has also now become the occasion for the Assistant Town Clerk to display his stand up comedian skills, and we were entertained by a succession of witty stories, delivered in his usual slightly deadpan way. 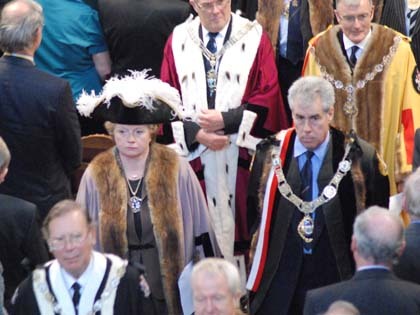 Then the Lord Mayor and Aldermen returned in procession into the Hall, with the Lord Mayor elect, Michael Bear, now on the Lord Mayor’s left. His entry was greeted by a cheer from the assembled Liverymen. 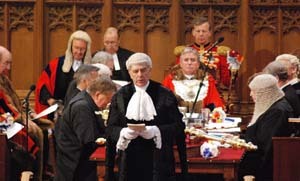 Once all had returned to the dais, the Lord Mayor elect was called upon to declare his assent to take this office and the Swordbearer placed the chain around his neck. He then addressed the Common Hall. This was followed by resolutions of thanks to the current Lord Mayor, and then to the two previous Sheriffs, all of which were passed unanimously by the Livery, and to which the Lord Mayor and late Sheriffs responded. 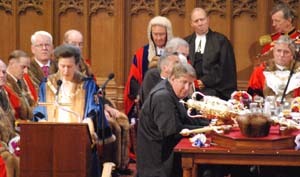 The resolution of thanks to the Lord Mayor was moved on behalf of his mother Livery, the Butchers Company, by its current Master, Her Royal Highness, Princess Anne. 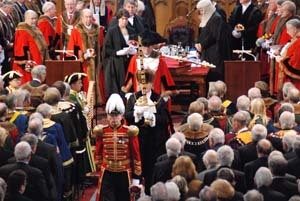 At the end of the ceremony, the Lord Mayor, the Lord Mayor elect, the Aldermen and others left the Hall in procession, to be greeted by a fanfare of trumpets as they exited the Hall. 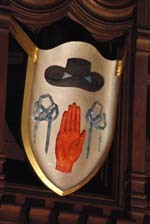 They were followed by the Livery Committee, and the Masters, Prime Wardens and Upper Bailiff of the livery companies. As you can tell, this was a ceremony which showed the City’s tradition and its ability to display pageantry, at its best. 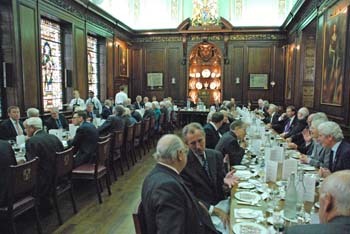 Liverymen left the Hall in the knowledge of a job well done, and for us Feltmakers, with an excellent lunch to look forward to at the Tallow Chandlers’ Hall. It has become a very welcome tradition, after both the Shrieval and Mayoral elections, for the Tallow Chandlers Company to invite members of, not only the Feltmakers, but also the Bowyers, the Lightmongers, the Curriers and the Coachmakers companies to join them for a lunch, which this year, as usual was excellent, informal and fun. Feltmakers who have not attended this, or the earlier Shrieval election, are strongly encouraged to do so next year, as these are occasions not to be missed, and to take part is one of the privileges of being a Liveryman.